Carnethic Penthouse, Carnethic House in Fowey, S Cornwall sleeps 4 people. Carnethic Penthouse is set in the award-winning gardens of a Regency country house on the edge of Fowey on Cornwall’s south coast. The holiday property was awarded the VisitEngland 5 Star Gold Award 2012/3 and it enjoys shared use of a heated 15m swimming pool, sauna, hot tub and changing room. 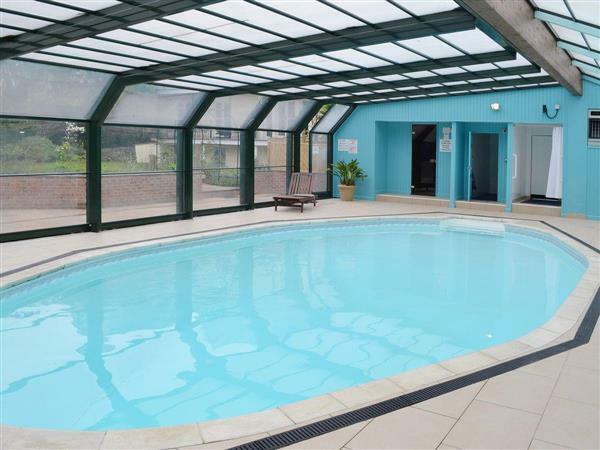 The pool lies within beautiful gardens, set to lawn with shrubs, trees and plants and the pool house has a retractable glass roof, which can be opened to enjoy the sun or closed to maintain a perfect environment to enjoy the warm water of the pool. Two flights of stairs to entrance. Spacious living/dining-room with wooden floor, views to the sea and access to roof terrace. Spacious well-equipped kitchen with range (for cooking), granite work surfaces, breakfast table and tiled floor. Study with sofa bed (for alternative sleeping). Two double bedrooms, both with 6ft zip and link bed and TV; one with en-suite bathroom/W.C. with shower attachment, one with en-suite shower room/W.C. Separate W.C.
For a better idea of where Carnethic Penthouse is, you can see Carnethic Penthouse on the map below. Carnethic Penthouse is in Cornwall; should you be on the lookout for a special offer, you can find all the special offers in Cornwall. It's always worth checking to see what is on offer at the moment. Do you want to holiday near Carnethic Penthouse (TAH), you can see other cottages within 25 miles of Carnethic Penthouse; have a look to find your perfect holiday location.